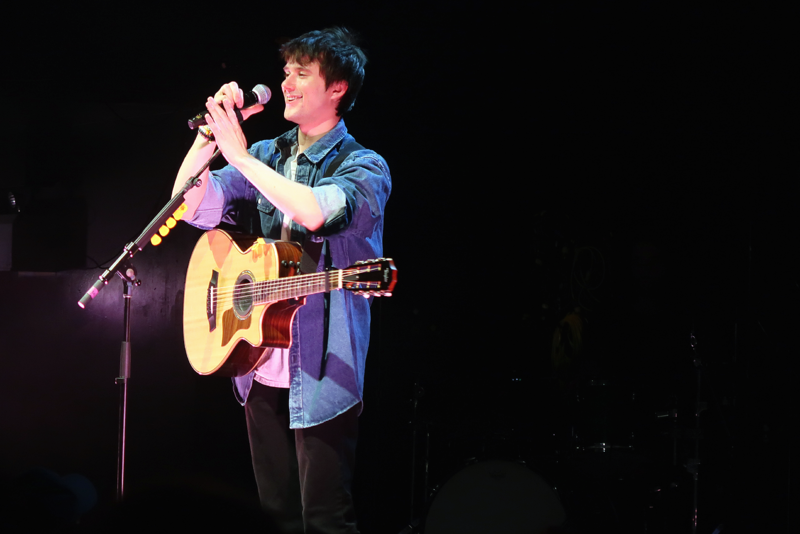 Just a few years ago, pop singer-songwriter Alec Benjamin was hustling his way to future stardom, performing for teenage fans in line to see the likes of Shawn Mendes and Troye Sivan. Now, he’s the artist people are paying to watch, with Benjamin on his second near sell-out tour in six months. His current Outrunning Karma Tour follows the November release of his debut album ‘Narrated for You,’ a selection of beautifully crafted and honestly written songs including the top-charting “Let Me Down Slowly.” This is just the beginning of a big year for Benjamin, who continues to book summer festival sets and is working toward releasing his sophomore album in the fall. RUtv News sat down with Alec before his recent sold-out Toronto show at the Mod Club Theatre to get the inside scoop on working with Alessia Cara, the songs that almost didn’t exist and why music festivals are like Costco. We’re about halfway through the Outrunning Karma Tour. How are things going? Things are going really great! I’m excited to be back in Toronto and back on the road. This is our first time having a tour bus too, so that’s nice. I’ve been stocking it with snacks and a lot of carbonated water. A wide variety of clothes, too. You recently re-released your smash single “Let Me Down Slowly” with one of our favourite Canadians, Alessia Cara. How did that collab come about? We met on Twitter. One of her fans found an interview of hers where she spoke about my music and I thought that was so exciting because I love her music. So, I reached out to her and that’s kind of how the whole thing came together. The story behind the song… It was one of the first times where I thought that someone was going to leave me, and I was like, please be nice! Are there any songs on ‘Narrated for You’ that fans would be surprised to know almost didn’t make the cut? My four favourite songs are “If We Have Each Other,” “Let Me Down Slowly,” “Death of a Hero” and “Boy in the Bubble,” and then I like “Annabelle’s Homework” but that almost didn’t make it on. “Swim” also almost didn’t make it on. Those original four were pretty much the ones I knew were going to be on it, and every other one was kind of interchangeable. You posted a video on YouTube singing “Let Me Down Slowly” to a group of strangers on the beach. Is that reflective of your goal as a musician – to naturally connect with as many people as possible? Yeah, it definitely is. I think also one of the reasons why I became an artist is because there’s this missing part inside of me I feel like that just needs people’s approval and making songs is just a byproduct of my pursuit to win over people’s approval. I can’t really decide if I like songwriting or if it’s just something that happens because I feel like this is something I need to do. You’ve had some pretty memorable celeb encounters, particularly with John Mayer. From you being a fan of him, to him being a fan of you – full circle moment or what? That was really cool. We met over Instagram. He just found my music and sent me a message and was like, ‘Let’s hang out.’ And we did. I told him the same thing that I told you about how I feel and he was like, ‘Just try to keep it even.’ Things go up and down and you just have to stay the course, and he was like, ‘You’re on the right track,’ which was really nice to hear from him. life . officially . made . not only is @johnmayer one of the most talented musicians/songwriters of all time … he is also an incredible human being . still can’t believe this is real . thank you , John for being so kind to me . you are the best . What’s one piece of advice you would give to young musicians? I don’t really necessarily feel like I’m in a place to give advice only because I’m still figuring things out myself. I’m not always sure if I’m on the right path! But one piece of advice that I would give people is maybe not about music but just about trying things, like don’t be afraid to experiment. Also, listen to yourself. Only you know what’s right for you. The summer music festival season is upon us and you’re set to play MO POP, Lollapalooza and Osheaga in Montreal. Who are some of the artists you’re hoping to catch? I really like ROSALÍA, so I want to see her. Honestly, the cool thing about a music festival is sometimes there’s an artist who you don’t expect that just blows your mind, so I don’t really want to set expectations. Music festivals are like a Costco, or a buffet, where it’s not necessarily the best place to see your favourite artist but it’s worth it because you get to have a piece of everything. And maybe you’re like, hmm… I don’t really like curry but I don’t have to pay extra for it so I’ll just try it! You discover so much music. What can fans coming to the rest of the Outrunning Karma Tour expect? They’re going to hear most of the songs on the album. If you follow me online and then you listen to my music, it’s pretty much exactly that. I’m not going to tell people to expect authenticity, but if you feel like the music you’ve been listening to is authentic then you will feel the same way when you come to the show. If you feel like it’s not and you come to the show, you’ll still feel the same way [laughs].